Luipa, the ‘Fish-gut Eater’, is listed as the first of the Eighty-four Mahasiddhas in the tradition of Abhayadata Sri. Luipa’s legend relates that he was a prince in the island kingdom of Sri Lanka, who having inherited his father's throne had nothing but contempt for wealth and power, and eventually managed to escape to the South Indian kingdom of Rameshvaram. Here he adopted the guise of a wandering yogin, and yet his handsome appearance and regal manners ensured that he had no difficulties in procuring food and shelter. Having wandered northwards across India he reached Bodhgaya, where he received some teachings from the local dakinis. From here he journeyed on to the capital city of Pataliputra, where he chose to reside in a cremation ground close to the River Ganges. After realizing the profound truth in the words and perception of this dakini-courtesan’s teaching, the yogin-prince chose to undertake a unique spiritual practice on the banks of the River Ganges. This practice was to live off the entrails of the fishes that the fishermen caught and their wives disemboweled. 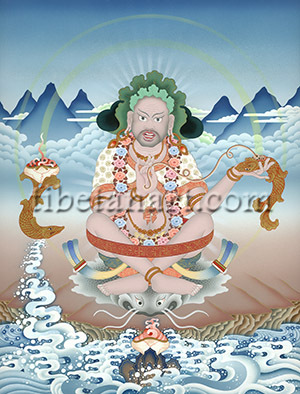 For twelve years he performed this practice, transforming the fish-guts he ate into the nectar of pure awareness, after which he attained mahamudra-siddhi and became known as Luipa, the ‘eater of fish guts’. Other historical accounts relate that the young prince was initiated into the Chakrasamvara Tantra by Shavaripa, who in turn was a disciple of the great Mahasiddha Saraha. This places Luipa’s date to the late 8th and early 9th century, with both Saraha and Luipa being instigators of Chakrasamvara Tantra lineages that were then transmitted to mahasiddhas such as Ghantapa, Tilopa, Naropa, and Marpa Lotsawa who then transmitted this practice into the Kagyu tradition of Tibet.